Printed on 100% recycled Paper bag. Front reads: Best Dad Ever! Happy Father's Day Inside reads: Here's to you! Thank you for everything you do! 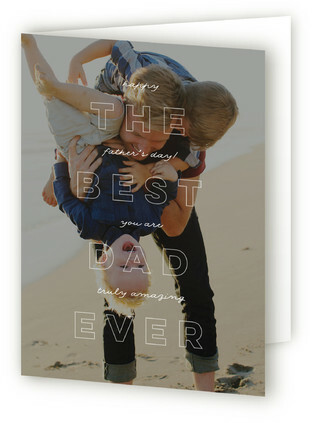 Wish Grandpa a Happy Father's Day with this lovely letterpress card. Features playful stripes and a wonderful message: You Put The Grand in Grandpa. Happy Father's Day! Blank on the inside. Single 4 Bar folded card with curry envelope.